US military commanders and political leaders have never advocated Turkish withdrawal from the island, or compliance with the UN resolutions. Instead, they have recommended incorporating both parts of Cyprus into the North Atlantic Treaty Organization (NATO). The political and military commands in Ankara have been reluctant to accept a NATO solution for Cyprus because they object to what they regard as “dilution” of their army on the island. The Nuland plan is the latest attempt to give Ankara what it wants, and override Greek Cypriot objections. Nuland has also told Anastasiades she wants to accelerate agreement on the terms of settlement before the US presidential election in November. 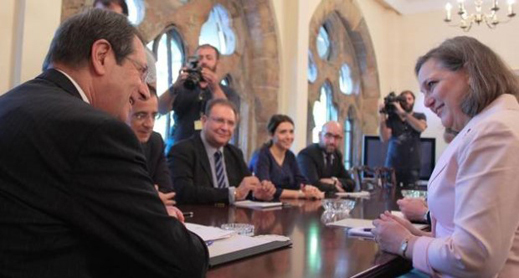 This, political sources in Nicosia say, is what Nuland (below, right) and Anastasiades (left) discussed last week. The Turkish regime in the north says it is counting on a parallel payoff. At Nuland’s Turkish talks there was a UN representative, Lisa Buttenheim. Buttenheim, an American, has served as a UN official in Jerusalem, Kosovo, and Belgrade. Buttenheim (below, left) is not the only UN official engaged in the Cyprus negotiations in favour of a NATO “guarantee” of Cyprus. A presidential-level Cypriot source says Espen Barth Eide (right), Buttenheim’s superior and the Special Representative of the UN Secretary-General on Cyprus, “is working on NATO guarantee through his party comrade and childhood friend, the current Norwegian Secretary-General of NATO.” Barth Eide is a former Norwegian defence minister and foreign minister, whose career has been advanced by former party leader and former prime minister Jens Stoltenberg. Stoltenberg became NATO’s Secretary-General in October 2014. A US Embassy cable from Oslo of 2008, published by Wikileaks, has reported Barth Eide as “a skilled and subtle interagency player who is largely pro-U.S…On several important issues Barth Eide has been helpful, such as missile defense (where he helped prevent a Norwegian veto of NATO plans)…[he] also takes pains to stress NATO as the cornerstone of GON [Government of Norway] security policy and the importance of the Norwegian-U.S. relationship.”. For weeks now in Moscow, there have been public hints that Nuland has resuscitated the scheme for withdrawing Turkish forces under the Turkish flag, then returning them under a NATO flag. In Nicosia in December, Foreign Minister Sergei Lavrov warned that such a scheme would be unacceptable to Russia. “The sides should reach agreements that would provide these security guarantees on a fundamentally new basis,” Lavrov said, “which will be acceptable to both Cypriot communities…This role should be primarily played by the UN Security Council.” For more details, read this. As for the terms to be agreed, Moscow has added: “We oppose any attempts at imposing on the participants of the intra-Cypriot negotiations any formulas of settlement, artificial negotiating schedules, and arbitration.” That’s three strikes in a row — one at NATO; one at Nuland; and one at Barth Eide. In the Cyprus opinion polls ahead of the May 22 election, Anastasiades’ DISY party has been losing ground to AKEL, and also to the small nationalist parties. Source: https://en.wikipedia.org/wiki/Cypriot_legislative_election,_2016 The polls indicate that the top three issues for voters are the economic situation; unemployment; and the terms for the inter-communal settlement. A large majority of Cypriots is opposed to any form of security guarantee or the presence of Turkish troops on the island. Anastasiades has been forced into publicly defending himself and his associates from widely published, widely believed allegations of corruptly protecting their wealth when, in return for the European Union’s bailout of the Cyprus banks, Anastasiades agreed to the “haircut” – the confiscation of Cypriot depositors’ bank accounts on March 25, 2013. Anastasiades has also been linked to extortion by a former deputy attorney-general now on trial for abuse of power; and to privatization scams. The president told a press conference of selected reporters on April 18 that he and his government have had “zero tolerance” for official corruption. He claimed his administration had been aiming particularly at “politically exposed persons [PEPs] by giving control to approved auditors for disclosure of their property declarations.” For more details on the international rules for PEPs, read this. 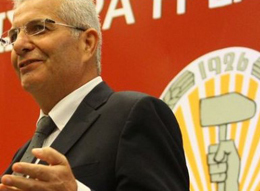 One of the leading investigative media in Cyprus, Second Reading (Δέφτερη Ανάγνωση), has recently reported on the involvement of Anastasiades, his law partner Theofanis Philippou, and their Imperium management group in transactions with a well-known PEP from Russia, Leonid Lebedev. He is now a fugitive from Russian charges of grand larceny and fraud. 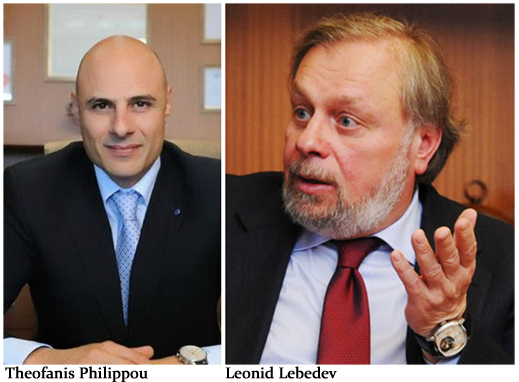 In 2011 the Anastasiades law firm helped Lebedev obtain Cyprus citizenship, which Philippou later concealed in a Cyprus court proceeding against Lebedev by a German bank. The Anastasiades law firm and Imperium have also set up offshore company schemes for Lebedev, and a Cyprus trust for moving untaxed cash out of Cyprus into US banks. Lebedev has introduced his offshore business record into court cases in London and in New York, where he is claiming he is owed $2 billion for oil company shares from Victor Vekselberg and Len Blavatnik, former shareholders in the TNK-BP oil company. They say they bought Lebedev out for $600 million between 2005 and 2006. Tracing that money is now crucial to the outcome of the New York Supreme Court case. For background on the court deliberations so far, read the backfile. Last week, lawyers for Vekselberg and Blavatnik asked Supreme Court judge Salliann Scarpulla to make an official request to the High Court of Ireland so that they can subpoena witnesses and obtain documents revealing — they have told the court — that Lebedev and his associates used a Dublin front company, Coral Petroleum, to take, then hide the $600 million, after the payoff from Vekselberg and Blavatnik. According to the publicly accessible court files, if the New York judge agrees to issue her request, and the Irish court accepts it, then the “owner, director, employee and/or agent” of Coral Petroleum and its accountant in Dublin, Roberts Nathan, will be ordered to reveal all “communications between Coral and Lebedev (and/or his agents and representatives.” Since 2011 the principal agents and representatives at Coral Petroleum have been Philippou, the Anastasiades law firm, and their Imperium Group. So will the New York and Dublin courts identify Anastasiades and Philippou as the key witnesses in Lebedev’s $2 billion claim? And is there evidence of Anastasiades’ personal involvement in Lebedev’s financial transactions through Cyprus which may expose him to the same test of transparency and propriety he claimed publicly on April 18 to apply to other officials in his government? On April 18, Second Reading reported on the Lebedev case, and published several questions for Anastasiades to answer: “According to many recent Cyprus press reports, you and your partner, Theofanis Philippou, were in charge of the Anastasiades law firm and the associated Imperium group of companies which arranged the grant of Cyprus citizenship and passport to Lebedev, when he was a Politically Exposed Person according to the Cyprus money-laundering rules? Are you aware of the criminal offences in Cyprus of Lebedev and his Cyprus lawyer, Mr Philippou, your law partner, including perjury in the Cyprus courts; violation of the Aliens & Immigration Law and regulations; concealment of the proceeds of crime in violation of the Central Bank regulations on admitting Politically Exposed Persons (PEPs) to Cyprus; and money-laundering on a billion-dollar scale?” So far the president hasn’t replied. 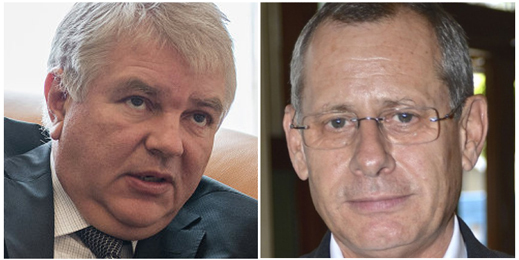 Does the evidence of the Lebedev case provide opportunity for US officials like Nuland to pressure Anastasiades with threats of a criminal investigation of the Lebedev case evidence by US prosecutors?